All indoor practices take place in the beige hall of the UM Sports Centre (address: P. Debyeplein 15, 6229 HA Maastricht). All players from all teams practice together. The coach of the first team, will prepare a practice on Fridays in which you will get familiar with futsal tactics. 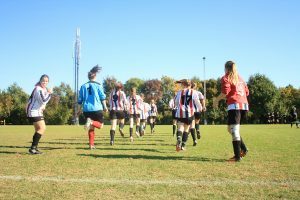 All outdoor practices take place at our brand new sport complex at Heugem (Grosnvelderweg 1, Maastricht) or our alternative pitches in de Heeg (Maastrichterweg 7). Check this practice schedule or add the calendar to your phone/laptop to see on which days your team is practicing at which location. Usually practice takes place on Tuesday and Thursday from 20.30 until 22.00 for all teams, but this may vary due to our rotation of practice location (see practice schedule). In case there are any changes we will inform you via Facebook. In case you want to practice with DBSV, but don’t want to play matches with us, you can become a practice member. Then you will not be registered at the KNVB and it is possible for you to play matches at your home club for example.